"Westergate" redirects here. For the river in Germany, see Westergate (river). Aldingbourne is a mixed rural and residential civil parish in the Arun district of West Sussex, England. 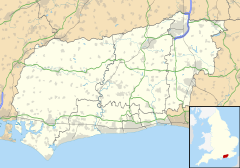 It is centred 4 miles (6.4 km) north of Bognor Regis and 4 miles (6.4 km) east of Chichester. The parish, named after the small village of Aldingbourne, also contains the much larger settlement of Westergate, as well as smaller settlements Norton, Nyton, Woodgate and Lidsey. The developed south and east of the parish is on fertile soil 7–15 metres above sea level, whereas north of the A27 road at the foot of the South Downs National Park the land reaches 37 metres in altitude. Eartham is the neighbouring parish to the north which reaches 223m above sea level on the wooded escarpment which is visible from some second storeys and looking up lanes of Aldingbourne. First documented in 683AD as Aldingburne, then 200 years later as Ealdingburnan, the name describes a stream or bourne (now known as Aldingbourne Rife) belonging to Ealda, a Saxon settler. The Anglican parish church is named St. Mary. According to Sussex Notes and Queries, the history of the church building "is not clear". Different parts of the church date from both the twelfth and thirteenth century, with the chancel having been built in the thirteenth century. Later additions include a porch dating from the seventeenth century and an organ chamber that was "wholly modern" in 1944. Agriculture occupies most of the land use and is a major employer. Other key industries include food and hospitality, general retail, the public sector, care, science and automotive-related careers. Ormiston Six Villages Academy (OSVA) is the main secondary school for the parish and surrounding area. It was formerly called Westergate Community School. The parish is home to Fontwell Park Racecourse, a venue in horse racing and Denmans Gardens which specialises in exotic and unusual plants. Fontwell Park has a compact figure-of-eight chase course and an oval hurdles course. ^ Glover, Judith (1997). Sussex Place Names: Their Origins and Meanings. Countryside Books. p. 9. ISBN 978-1-85306-484-5. ^ "About Aldingbourne". Aldingbourne. Arun District Council. Retrieved 27 March 2009.